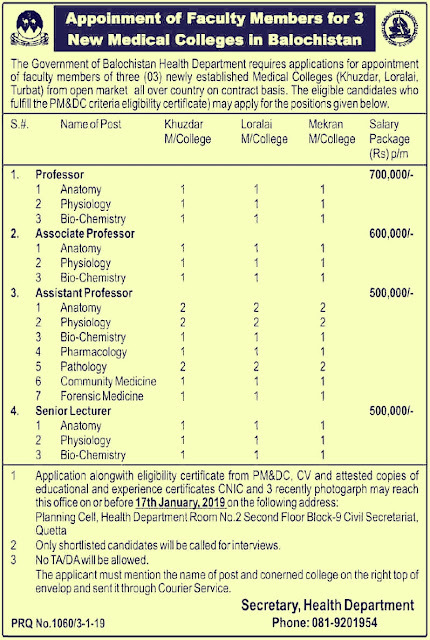 Government of Balochistan have announced jobs in the Health Department.Appointment of Faculty Members for 3 new Medical colleges in Balochistan.The Government of Balochistan of three new established Medical colleges (Khuzdar,Lorala,Turbat) form open market all over country on contact basis.The eligible candidates who fulfill the PM&DC criteria.Professor,Associate Professor, Assistant Professor and Lecturers Jobs in Government of Balochistan Medical College.Balochistan hospital can apply to people from across Pakistan in this job.Jobs in Balochistan Hospital have been announced after a lot of time. Application alongwith eligibilty certificate from PM&DC, CV and attested copies of educational and experience certificate ID Card on the following address. Planning Cell,Health Department Room no 2 Second Floor Block-9 Civil Secretarial Quetta.